It’s that time of the year again when consumers scrimp and save to claw together enough money to purchase Apple’s new, expensive devices, and YouTube channels take the opportunity to destroy them to see exactly how much abuse they can take. Popular channel JerryRigEverything has put together a video which not only takes a glance at Apple’s iPhone 8, but also puts it through a Mohs test to see exactly how much punishment it can take. The Mohs test may be familiar to a lot of people who have experience with these types of videos. But for those who don’t, it basically involves taking coins, knives, screws, and other pointed objects and running them across the glass and surfaces of iPhone 8 with the intention being to see at what level the damage occurs. Apple’s iPhone 7, and most other well-built devices on the smartphone market, typically get damage around about level 6. That’s exactly where iPhone 8 succumb to the test, with the display becoming scratched at level 6 and deeper more noticeable damage happening at level 7 and beyond. The test also involved trying to bend the device and seeing how much pressure it actually takes before the frame of iPhone 8 starts to warp. 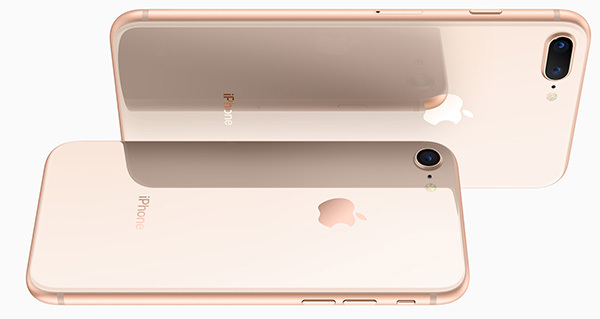 In what will be good news for Apple and consumers it would seem that the move to glass on the front and rear of the device has meant that the hardware has more structural stability and resistance than iPhone 7 and its aluminum body. The full durability test by JerryRigEverything can be seen in the video embedded below. Another YouTuber has also taken the opportunity to see how performant and fast iPhone 8 really is. YouTuber MadMatt put an iPhone 8 Plus and iPhone 7 Plus head-to-head in tests involving loading web pages, and launching apps installed on the device. There was definitely a performance improvement with the iPhone 8 fairing slightly better than iPhone 7, but it was the Geekbench test where it really showed its metal. Apple’s iPhone 8 Plus with its A11 Bionic achieved a single-core score of 4264 compared to iPhone 7 Plus’ 3345, and a multi-core score of 10396 compared to 5691 on 7 Plus. That’s quite a considerable improvement but shouldn’t be as surprising given we now know that it’s the fastest mobile phone out there by a mile. You can watch the complete speed test in the video embedded below.